Cut out the bottom of a paper plate, and use the rest as a base for the wreath. Using a printout trace some leaf shapes onto construction paper of the appropriate color. Cut out the leaves: you can cut out the more difficult shapes and leave the simple ones for your child to cut out. Or you could suggest to your child to color the leaves and then cut them out. 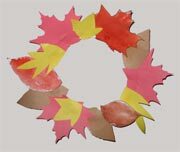 In our wreath we used all (I cut out maple leaves, my son colored a few leaves with watercolors and he cut out the simpler shapes). Glue all the leaves to the paper plate circle. You better use the liquid glue, not the glue-stick. 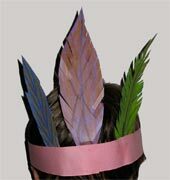 Make a headband by gluing together two long pieces of thick paper. Draw a few feather shapes on a piece of construction paper or use a simple white paper and then ask your child to color the feathers. Let your child to cut them out and then glue them to the band. You should use thicker paper for the feathers so they won't bend over. Finish the picture of the leaves. Talk to your child about trees and leaves in the fall. Ask him about the colors of autumn leaves. Print out the unfinished pictures of a few leaves. Suggest to your child to finish the picture using the dots. Then let him color it with crayons or colors. Complete the picture of the leaves. Talk to your child about trees and leaves in the fall. Ask him about the colors of autumn leaves. Draw his attention to the symmetrical shapes of the leaves (if you draw an imaginary line down the middle then the two halves will match each other). Print the picture of the unfinished leaves. Suggest your child complete them, trying to make both parts symmetrical. Ask him to color the leaves. 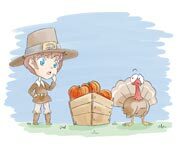 Add a few details to a hand print and you can turn it into picture of a turkey. Pour a little amount of paint into a paper plate. Use white or colored paper. 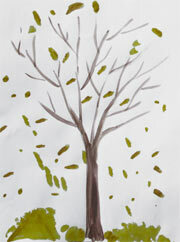 Older kids can try to paint tree trunk and the branches. Print out a picture of the autumn leaves. Suggest your child color them. Younger kids can use crayons. Older kids can try to color using watercolors. Set up several different pumpkins in front of your kid(s). 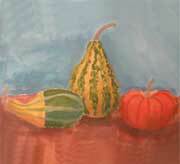 Ask them to make a sketch with a pensil and finish the painting using watercolors or tempera paint. Younger kids can use crayons.